Custom Rollform is more than rollform equipment and applications. 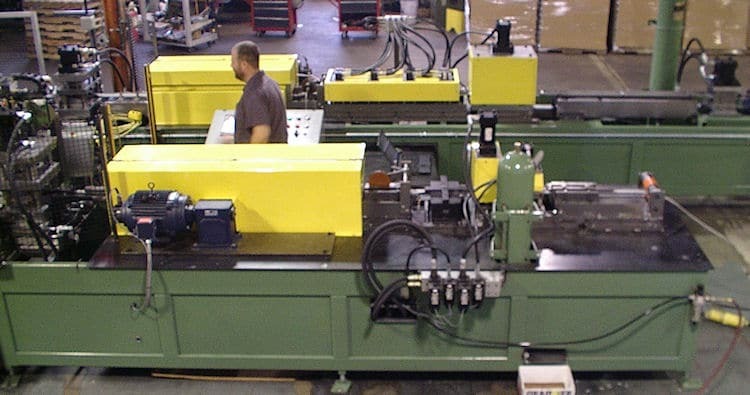 We are one of a few equipment manufacturing companies that can design and manufacture complete turnkey fabrication systems. We are not a component integrator that ties various systems and components together from a variety of manufacturers. Everything you see on this video was designed and manufactured by a single source manufacturer (Custom Rollform Products). All the programmed electrical, hydraulic and pneumatic systems were designed and integrated by Custom Rollform to insure you get years of service from a single source supplier. Two (2) Coil Fed Systems to form & assemble Box Fans complete from pre-painted mild steel. This is a coil feed notching, punching, rollforming and tangent form applications integrated into a complete automation system. This system consists of two (2) rollform systems to simultaneously manufacture the two (2) fan components required for this Box Fan Application. 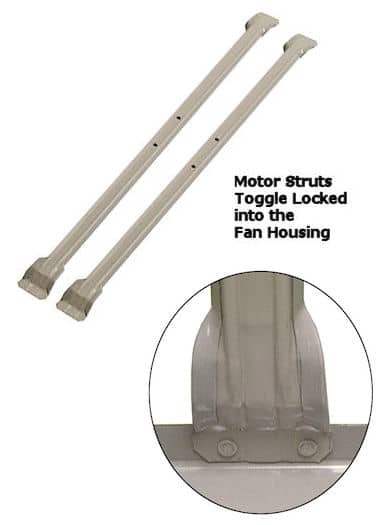 As the parts are fabricated they are fed directly into a series of forming and assembly operations to toggle lock the housing together, insert the motor mount struts, then clinch lock the struts into the fan housing. The system starts with two (2) special designed uncoilers to handle 72” diameter coils. The uncoilers feed and payoff the coil strips directly from the horizontal skidded coil stack to minimize extensive downtime for coil changeovers. The pre-slit coil strip is pre-painted 22 gauge mild steel. The coil strips are then fed into the two (2) side-by-side rollform systems designed to pre-punch and notch the strip, rollform the fan housing and motor strut profiles, then cut and endform the parts. The system is designed to manufacture 12 complete fans per minute on a five (5) second production cycle. The corresponding motor strut has to produce 24 parts per minute on a 2 ½ second cycle. 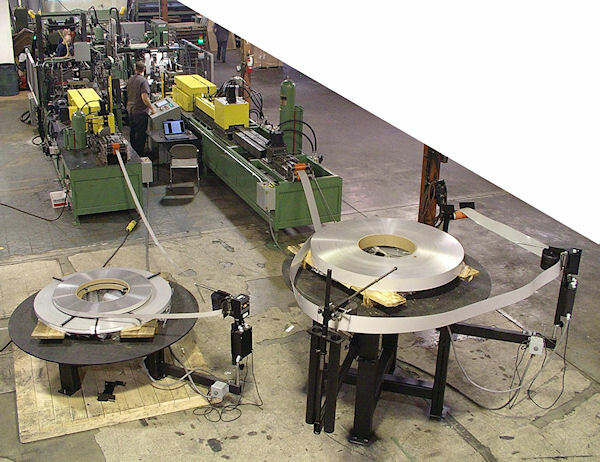 After the strip for the housing is rollformed and cut to length it is fed directly into an automatic four stage tangent forming unit to form it into a full wrapper four sided housing with 4” radius corners. 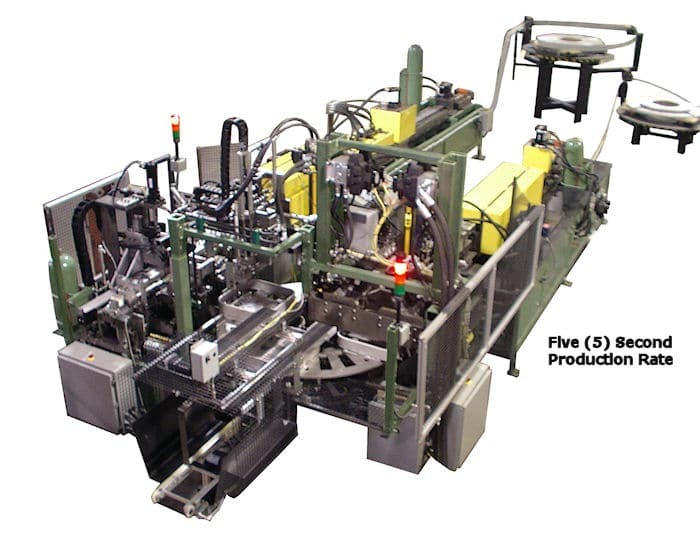 The hydraulic tangent forming unit shuttles the part laterally through the four tangent forming heads and positions it to clinch lock and load onto the four station assembly turn table. In the last stage of the tangent former, the ends of the parts are clinch locked together in three places. 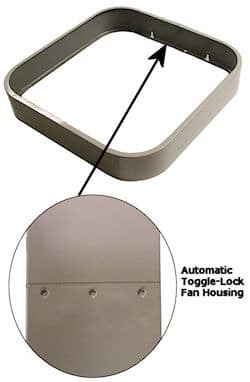 To meet the production rate, the clinch lock press is incorporated into the pick and place part shuttle that transfers the fan housing onto the four station assembly unit. After the completed housings are positioned on the rotating index turn table they are cycled to the next station that installs the motor mount struts. The motor mount struts are pre-notched, punched, rollformed and cutoff, feeding them directly into a pick and place transfer. The lead and trail ends of the struts are swedged and formed as they are cut-to-length. The first pick and place transfers the motor struts from the cutoff press directly onto a feed transfer conveyor every 2½ seconds. The transfer conveyor indexes the struts under a special two part pick and place feed, designed to feed and position two motor struts into the fan housings. The two part transfer must rotate the motor struts approximately 35° to clear the top fan housing flange, then position them onto the fan housing and into the fixture. Once the motor struts are positioned onto the jig fixture the fan assembly is indexed into the fan strut clinch locking unit. The special clinch lock presses are designed to join and clinch lock both ends of the struts to the fan housing. Each motor strut was clinch locked in four places, two per end, for a total of eight clinch locks every feed index cycle. After the fan housings are completed they are transferred onto an exit conveyor designed to flip the part and feed it onto the customers conveyor system. The parts are then fed directly to the assembly line and packaged on a just-in-time production schedule. It is good to see manufacturers willing to automate their products and bring a lot of their overseas production back to America. 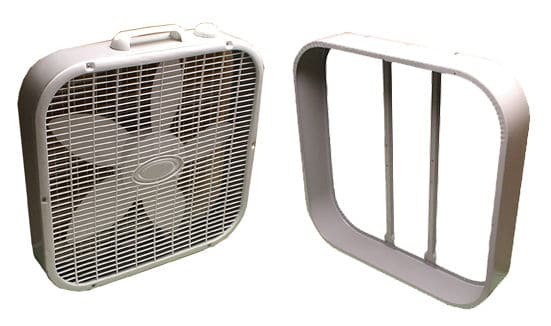 Originally this product required approximately 15 – 20 individual steps to manually produce and assemble the fan housings. Parts were spot welded together and needed to be painted before they could be assembled. The clinch lock application allows parts to be fabricated from pre-painted coil strip and sent directly to final assembly. Custom Rollform Products is your one stop supplier for all your sheet metal applications. Everything is designed, engineered, plumbed and programmed by Custom Rollform to ensure years of service from a single source manufacturer. Call Custom Rollform and let them design a system for you.